Xiaomi products aren’t easily come by in the UK but the firm is making a name for itself by making top-spec devices at budget prices. With Apple setting the standard for many the Chinese latest tablet is its answer for theiPad mini. Here’s our Xiaomi Mi Pad 2 review. To whet your appetite, the Xiaomi Mi Pad 2 is a 7.9in high resolution tablet with a metal design, Intel Atom processor and runs Android or Windows. It may mirror the iPad mini in many ways but it’s much more affordable, starting at just £144/$204. But can Xiaomi really offer a decent alternative to Apple at such a low price? As you are probably well aware, it’s not possible to buy Xiaomi products directly from a retailer in the UK. However, it’s not hard to get hold of them if you’re willing to go down the import route. Our Mi Pad 2 is from Gearbest and costs just £144 ($204) for the 16GB model in ‘golden’ colour. The silver model is an extra £5/$8 and you can upgrade to a 64GB version if you’re willing to pay £162 ($247). That’s a small price to pay for a decent storage upgrade. Those prices are excellent, especially when the site offers free shipping worldwide. However, do be aware that you’ll need to pay import duty, which for this tablet amounted to £26/$39. The total is still under £200/$300 for the entry-level model which is a lot of bang for your buck. While the original Mi Pad looked like a tablet version of the iPhone 5c with its colourful plastic rear covers, the firm has really stepped things up a notch with the Mi Pad 2. The second generation of its small-screen tablet has an aluminium chassis which, as mentioned, comes in either silver or gold options. We took a look at the golden model and the effect is very subtle and in certain lighting doesn’t really look gold at all. There’s no escaping the fact that the Xiaomi Mi Pad 2 looks like the iPad mini but to a large extent it’s going to. We’re not sure we could make a 7.9in tablet with a metal case and glass front without it looking similar. The lack of a physical home button and bevelled edge helps things, but the Mi logo on the back with ‘Designed by Xiaomi in Beijing’ etched below is perhaps a little too obvious, though. Whether this bothers you enough to not buy it is a personal decision but we’re impressed with the design and build quality of the Xiaomi Mi Pad 2, especially when you consider how much cheaper it is than its fruit flavoured rival. The aluminium has a smooth finish which is nice to touch although can be a little slippery and the rounded edges look stylish. The tablet is both thinner and lighter than its predecessor at 7mm and 322g making it very svelte indeed, although not quite as much as the iPad mini 4. Some of the Mi Pad 2’s specs don’t help it get away from the iPad mini copy situation. Namely the 7.9in screen size and matching resolution of 2048×1536 resulting in Apple’s ‘Retina class’ pixel density of 326ppi. This is not a negative thing; just that it’s identical to the iPad mini. The Mi Pad 2’s screen is excellent offering a crisp image with good contrast, vibrant but not garish colours and great viewing angles. There’s plenty of brightness available, too, and a reading mode which is accessible via the quick settings. As mentioned there’s 16GB of storage for the cheaper model. There’s around 11GB available and no Micro-SD card slot for expansion so we fully recommend spending the extra to get the 64GB model. Either way, the tablet has 2GB of RAM just like the original and many rivals, too. In the engine room, Xiaomi has switched from nVidia to Intel for the processor. 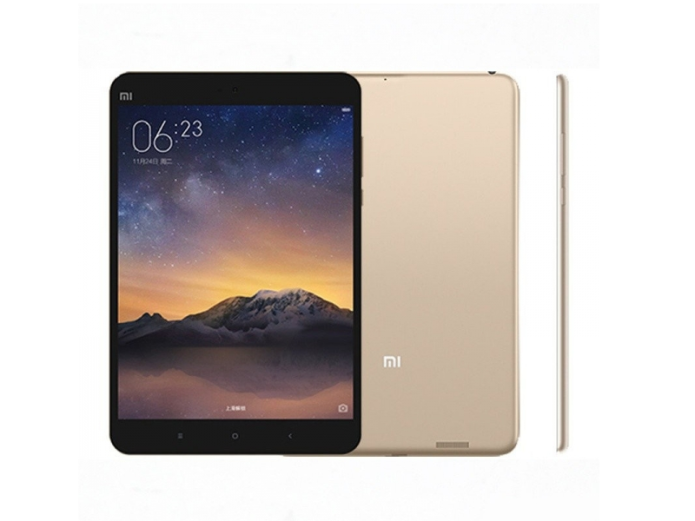 The Xiaomi Mi Pad 2 comes with an Atom X5-Z8500 64-bit 2.2GHz quad-core chip which has Intel HD Graphics GPU. We’ve found performance to be extremely good with minimal lag. iPad benchmarks are difficult to beat but as you can see, the Xiaomi Mi Pad 2 outpaces the iPad mini 4 in Geekbench 3 and is just shy on the graphics side of things. Xiaomi has reduced the capacity of the battery from 6700- to 6190mAh but that’s still large for a tablet this size. The iPad mini’s is around 1000mAh smaller. Battery life is a plus point for the Mi Pad 2 managed an impressive seven hours and 49 minutes with a score of 4696 in Geekbench 3 which is more than an hour better than the iPad mini 4. For the price, it’s no surprise that the Mi Pad 2 doesn’t come loaded with extra gizmos and gadgets like a fingerprint scanner or NFC. It does, however, have 11ac Wi-Fi, Bluetooth 4.1 and a reversible USB Type-C port which provides faster charging – although the downside is having loads of Micro-USB cables lying around which don’t fit. Like its predecessor, the Mi Pad 2 has an 8Mp rear camera (no LED flash) and 5Mp front camera. We’re not particularly impressed with either with most photos ending up blurry despite holding the device steady. There are many filters on offer but barely any camera modes such as HDR. The Xiaomi Mi Pad 2 is a bit different to most tablets when it comes to software because you can choose which operating system you want. It comes with either Android or Windows 10 – not the ability to switch between the two as per rumours. We took a look at the former so can’t comment on what it’s like with Microsoft’s OS, but it’s worth noting that the Windows model only comes in 64GB. The Android model runs 5.1 Lollipop and Xiaomi’s own MIUI 7.0 user interface. If Xiaomi has arguably copied the design of the iPad mini, the same argument can be made for the software on offer here. At a glance it looks far more like iOS than it does any other Android tablet. This is achieved with a grid of icons which are all forced into a square shape with rounded corners, making some (especially YouTube) look a bit stupid. These must be placed on homescreen panels as there is no app menu with which to hide them away. A bar at the bottom, which remains even when you swipe to another panel, holds four icons but you can add up to six. Swipe left from the main homescreen and they do disappear, revealing a hub of widgets including a calendar, clock, calculator, search bar and media controls. In true Android fashion these can be rearranged or removed as you please. The settings menu is laid out in a very similar way to iOS with a bar down the left side and the drop down notification panel is nothing like stock Android. It still provides notifications and quick settings but you swipe horizontally to switch between the two sections. Unlike iOS, Android requires navigation button and these come in the form of capacitive back-lit buttons below the screen. Like Samsung Galaxy devices, they are ordered recent apps, home, then back. Overall, the user interface is a pleasant experience with a stylish and intuitive design. It’s just more like iOS than Android which might not be what you’re looking for. You can, of course, tweak things like the launcher if you want a more Nexus-like experience and although we’re not big fans of the pre-loaded apps like Browser and Video, you can download the ones you like because there’s Google Play store access. You’ll probably also want to download a keyboard as the default one is confusing. Whether Xiaomi intended to or not, the Mi Pad 2 is an Android tablet disguised as an iPad mini. This may disgust you or be exactly what you’re looking for. Either way, we can’t deny that this is a well-made, stylish tablet with decent specs for the price. You’re best off getting the 64GB model and if the iOS style user interface is a turn-off, remember that Android is highly customisable.